Well, here we go. 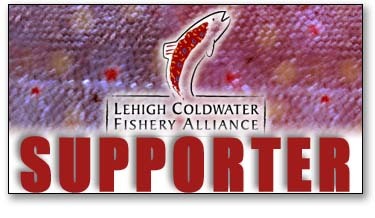 It is that time of year for the Agencies (PFBC, ACOE, DCNR, DRBC) to roll out the Francis E Walter Flow Plan. And just like last year and all the years prior to that since inception, the fishery is pretty much at the bottom of the totem pole when it comes to priority. There is no doubt that whitewater releases are the goal of these Plans and anyone from the Agencies that says enhancing the trout fishery is a priority is kidding themselves! The problem is there is just only so much water right now available for the fishery and whitewater, and until the ecosystem is given more of it, the fishery will forever suffer. This is a fact! As far as the specifics of the plan, it is almost identical to last years. So with this being the case, lets hope Mother Nature plays a bit nicer this go round so that we get a season that lasts longer than mid-June. One thing though that we did learn from last years rough (i.e., HOT) water conditions is that the trout do find a way to survive as was indicated to the decent catches of trout during the fall season. 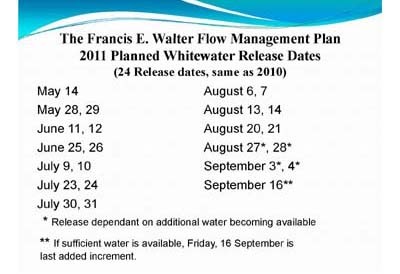 Anyway, the chart pasted to the right are the dates of the whitewater releases for 2011. It is a good idea to stay away from the middle river (Gorge area) during these days, but you might be able to sneak in an afternoon or evening outing if you hit it near the dam on a day of a release. Or you could hit the lower river (Lehighton downstream) in the morning of a release for potentially some action. However, the fishing after a release subsides tends to be a little iffy. January 1, 2011 - Happy New Year! 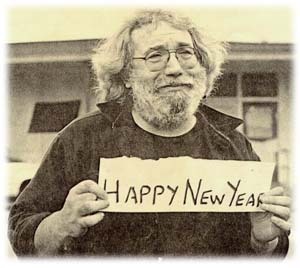 Happy New Year From FFPA!! Here is to slaying beef in 2011!! Check back in a little while for an update.